Do you put up an artificial Christmas tree each year but miss the scent of fresh pine from the real thing? I sure do and figured out a way to get the scent without the messy pine needles. Pallet wood can be transformed into a beautiful holiday centerpiece and when filled with fresh greens, you'll forget the tree is fake. Bonus, the pallets are free and so are the greens if you're lucky enough to have them right in your own backyard. The biggest job with this project is taking apart the pallet. This was the first pallet I'd ever taken apart and let me tell you I have a new respect for the female DIY bloggers who do this regularly - it nearly did me in. But if you're still willing to take on the task after all my complaining, a reciprocating or circular saw make the task easier. An easier option (and one I'm going to consider going forward) is to use old or new fence boards. Once you've dismantled the boards it's time to clean them. I used a bucket of warm soapy water and a scouring pad. The Natura Safe Sand you see in the photo below wasn't necessary. These are the supplies I used to embellish the pallet board centerpiece box. I've included a materials list towards the bottom of this post for your convenience. 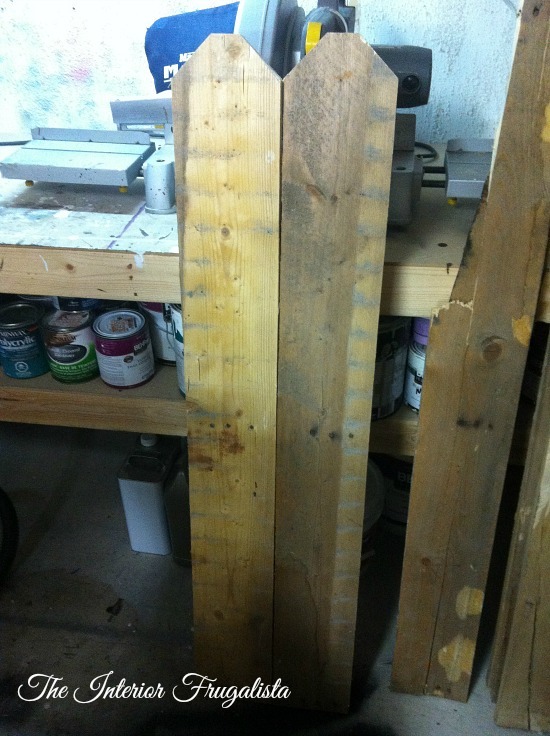 Cut two boards 20-inches long and two more 8-inches long. With a miter saw cut the ends of each board at a 15° angle. Assemble the box with carpenters glue and brad nails. For the feet cut blocks of wood 1" x 1 1/2". Glue the feet onto the bottom with carpenters glue, clamp in place and let dry overnight. 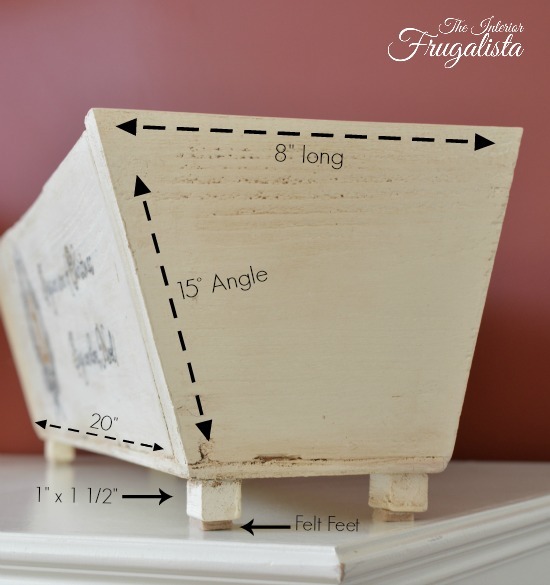 Paint the pallet box both inside and out. 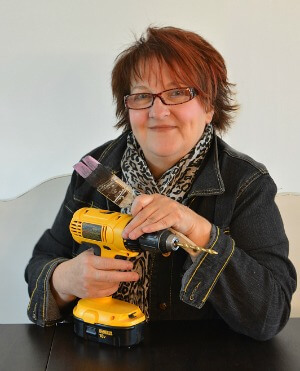 I used Annie Sloan Chalk Paint in the color Old White because that's what I had on hand. At the Graphics Fairy website, I found a lovely Decorative Ornament Image, enlarged the image and printed it with my laser printer. In Microsoft Word, I typed some of the lyrics to the song "Sing We Now of Christmas" using the font Lovers Quarrel and sized it to fit along with the graphic on the side of the box. Trace the image and lyrics onto the wood with carbon paper. I used a script liner art brush and black acrylic & gold metallic craft paint and hand painted over the transfer. Another option is to go over the graphic with a fine tip black and gold metallic marker. 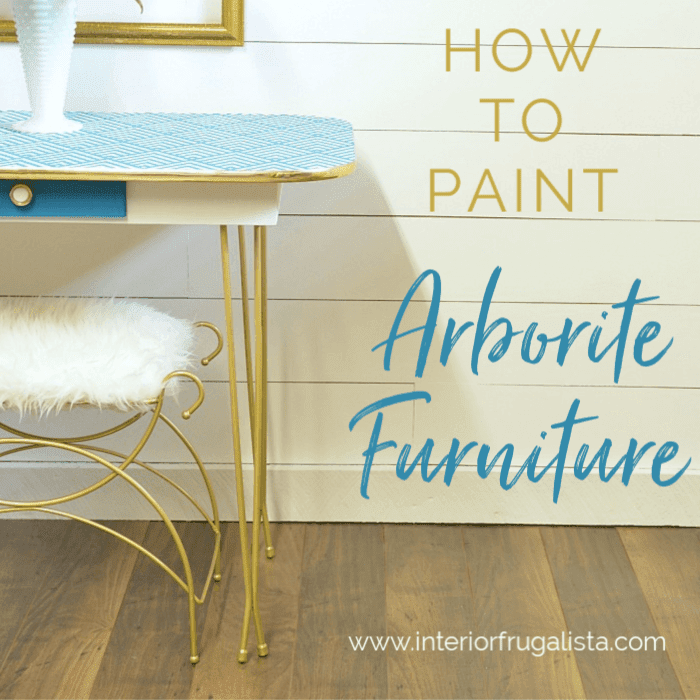 Once the paint or ink is completely dry, give the graphic a timeworn look by lightly distressing it with 220-grit sandpaper. Protect the painted surface and graphic with clear wax. To give the pallet box an aged patina (as pictured below), brush dark wax over the clear wax. Make sure to get the wax deep into the crevices and grain of the wood and wipe away the excess with a lint-free rag. Buff the wax lightly with a lint-free rag until the wax doesn't feel tacky, for a matte finish. At the dollar store, I bought four small glass vases and filled them with water and fresh spruce branches clipped from a tree in my backyard. The room was filled with the scent in no time. If you have access to pine, cedar or junipers, cut some of those too for added fullness and variety. Place a vase on each end of the box and two in the center. 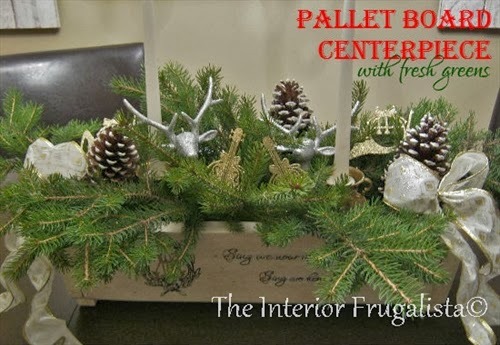 I found most of what I needed at the dollar store or my Christmas decoration bin to embellish the inside of the centerpiece box. Including cans of food to add height - it's all about working with what you've got! I found the cutest little teacup decorations at Canadian Tire to use as candle holders. To hold them in place I lit two tealight candles until the wax was melted and inserted two tapered candles, holding them in place until the tealight wax solidified (mere minutes). Next, I added a dab of hot glue to the bottom of the tealight holder to secure them to the teacups. This is where the cans of refried beans came in handy - they were perfect to raise the height of the teacup candle holders. I added a few faux greens to fill the empty cavities. I would have loved to use more of the real thing but didn't have any available nor did I want to spend money buying some. Next up was adding festive embellishments like snow dipped pine cones, glittery silver deer heads, and gold musical instrument ornaments. A pop of red from faux berry picks would have looked lovely too. For added fullness, I made bows with gold wired ribbon found at the dollar store and added them to each end of the centerpiece. I love the rustic charm of this pallet board centerpiece box and the scent is wonderful. I may go for a walk in the green belt behind our house with a pair of garden clippers in my pocket in search of more greens. Maybe I'll snip a few branches from our Mountain Ash tree for a pop of red from the berries. I love that I was able to create a beautiful scented centerpiece for our dining table for less than $10. If you'd like to get the look with a ready-made option, I gathered a collection you may find of interest. 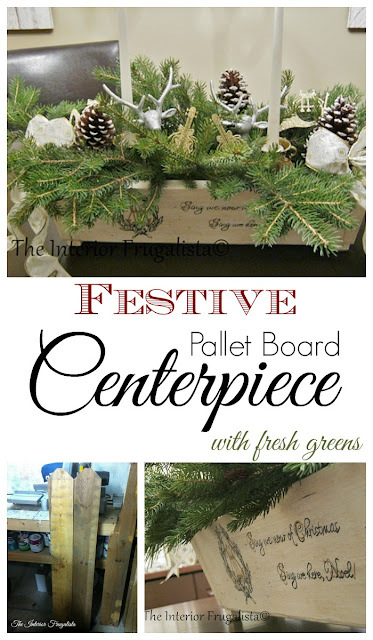 If you were inspired to make your own version of this Festive Pallet Board Centerpiece filled with fresh greens, please save it on Pinterest and/or share it with a friend. Marie, this is my kind of Christmas Centerpiece!! It is absolutely beautiful. Thanks so much for the inspiration!! 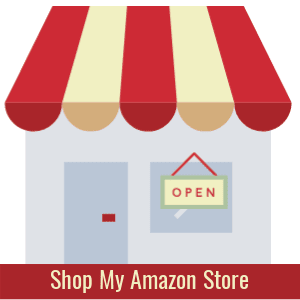 I'm so glad you like it! It was such fun to build and decorate. I think this Christmas I'm going to line the box with plastic and use florist foam for the greens to keep them watered and held firmly in place. They sure make the house smell nice!